In this Featured Article, entitled “Outside the Venue Walls: Revenue at your Doorstep” the ALSD’s (Association of Luxury Suite Directors) Max Snyder analyses how a lucrative new revenue stream has been identified at venues in the United States. 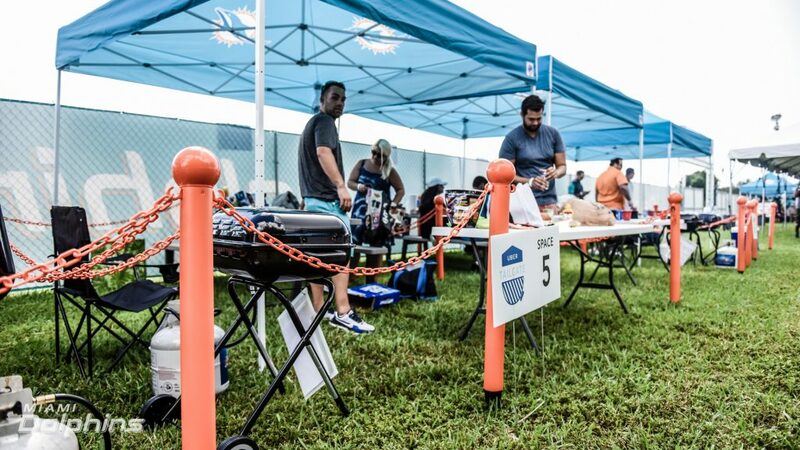 Previously left up to the fans to control, the tailgating experience is now a major focus for some teams and venue. Partnering with tech giants and hospitality consultants, these teams have found a lucrative new revenue stream outside the venue walls. Your venue isn’t as cool as it used to be. New technologies and higher fan expectations turn yesterday’s noteworthy into tomorrow’s norms, causing teams to examine and improve the fan’s round-trip experience, not just the destination. As a means of elevating the fan experience from start to finish, both professional and collegiate teams are starting to think outside the box, and in some cases, outside the venue walls. One of the primary areas of innovation is tailgating. 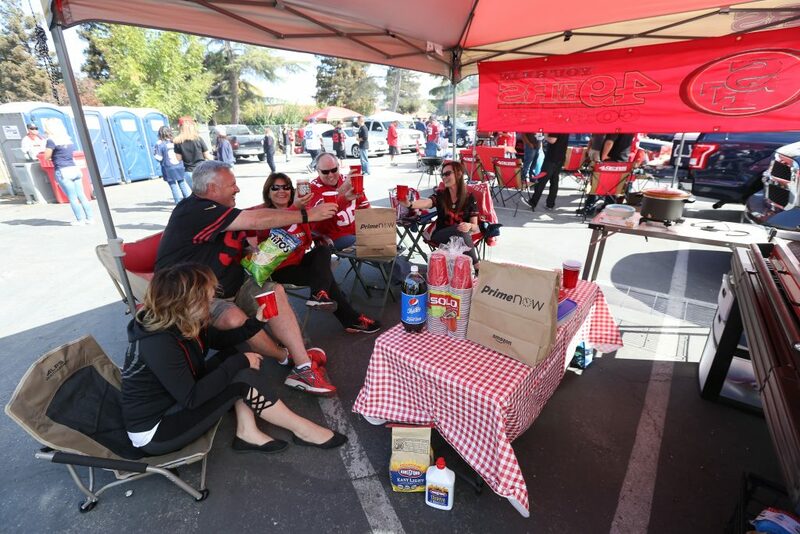 Over time, fans have sought to deliver the [tailgating] experience they want in their own way because a lot of teams have kind of ignored tailgating. What we’ve observed is that more people are spending time tailgating outside the stadium than they are inside the stadium. By leaving the tailgating experience up to the fans, teams have limited control of the overall fan experience, while losing an opportunity to generate potential new revenue. Now teams and their venues are partnering with solutions providers, from tech giants to VIP experts, in order to solve for these pain points in the parking lot. To reduce traffic and make parking more readily available, many teams have developed ride-sharing partnerships with Uber to provide an alternative option for fans to safely get to and from the venue. 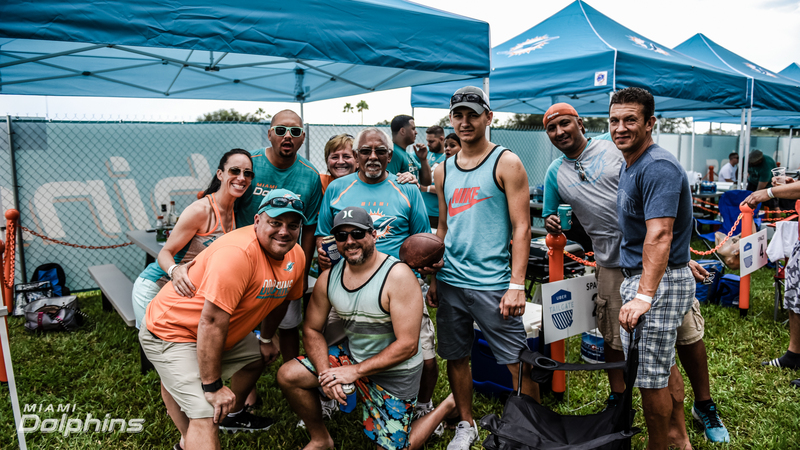 As part of the 2016-17 NFL season, the Miami Dolphins and Uber extended this experience to UberTAILGATE, a turnkey tailgating solution for fans who take an Uber ride to the game. We created 20 of these [UberTAILGATE] spots. It came about because we met lots of different fans that told us they would just like to be able to tailgate without having to set up and tear down [a bunch of equipment]. 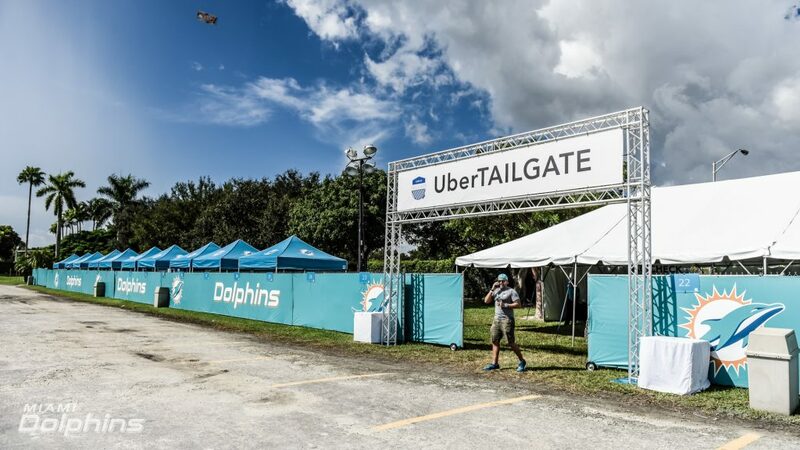 Formerly one of the Dolphins’ outer lots, the UberTAILGATE area is a fenced-off space adjacent to the parking lot’s Uber Zone, a dedicated pickup and drop-off area for fans riding to the game with Uber. 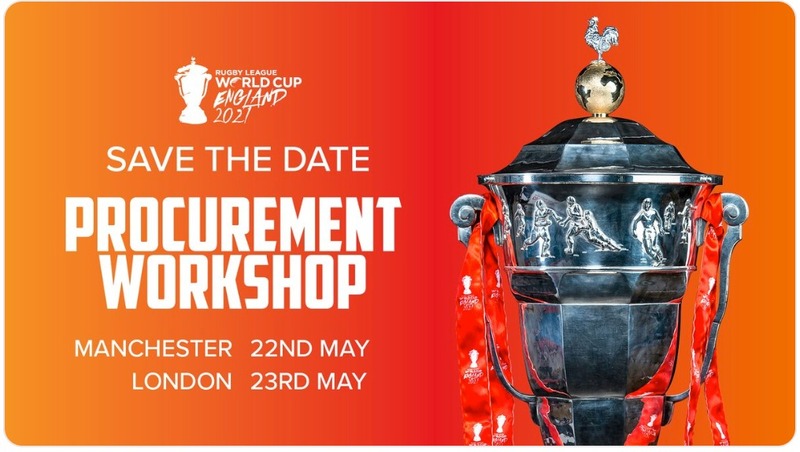 The idea is we’re working together with the Dolphins to solve the logistics challenge [of getting to and from the venue]. But also making sure that we’re paying homage to and recreating the [tailgating] experience that everyone gets really excited about when they go to these games. Starting at US$250, fans can pre-purchase one of the 20 UberTAILGATE spots online, up until three days prior to each home game. As part of each package, fans receive two one-way US$15 promo codes to and from the stadium and a dedicated 10-by-12ft space equipped with a tent, picnic table, grill, grill utensils and a cooler filled with ice. Each spot has a capacity of eight to ten guests who may bring their own fare or purchase food and beverages from a provisions store, operated by Centerplate. The first season of the tailgating partnership has seen a wide range of customers utilising the service. We have some season ticket holders that decide to do it a couple times, we have single-game buyers that want something unique and different. And then occasionally opposing fans that don’t have the ability to set up a tailgate because they’re coming in from out of town. In response to positive feedback, the Dolphins plan to expand both their Uber Zone for pickups and drop-offs and the UberTAILGATE area next season. 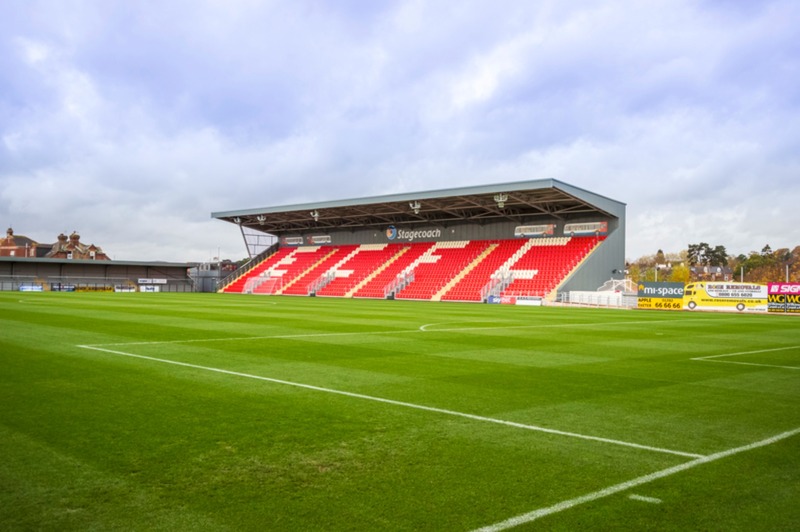 As third-party transportation partnerships continue to optimise ingress and egress at sports venues, teams will have a new asset in the form of vacant parking spots. Then the question is: what do teams do with that additional space that is now available …And how does that translate into ticket sales, attendance, and people changing their mindset about what it means to sit at home and watch the game versus come out and have a better experience because of how easily they can get to and from the venues. While Uber gets patrons to and from the tailgate, it doesn’t guarantee that they’ll arrive with supplies in hand. As of this past fall/autumn, whether you are a forgetful fan who misplaced the spatula or a party of eight looking for some extra chips and salsa, Amazon PrimeNow has you covered at Levi’s® Stadium, home of the San Francisco 49ers. Through the PrimeNow App and PrimeNow.com, 49ers fans with Amazon PrimeNow memberships can order gameday essentials directly to their parking spot in the majority of lots that permit tailgating at Levi’s® Stadium. Going back to when we built Levi’s® Stadium, the three pillars that we leaned on were technology, sustainability, and fan experience. The fan experience side is critically important, and Amazon Prime Now plays a part in that by getting fans their gameday essentials. 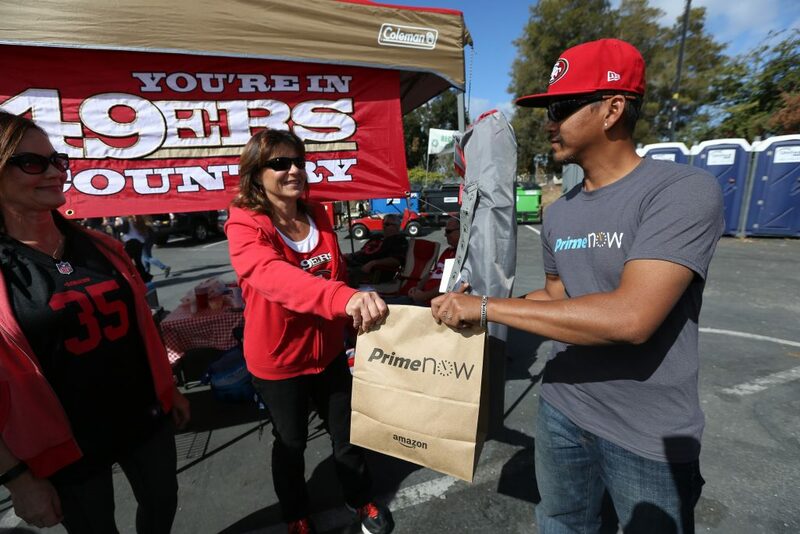 Through the PrimeNow App and PrimeNow.com, fans with Amazon PrimeNow memberships can order gameday essentials directly to their parking spot in the majority of lots that permit tailgating at Levi’s® Stadium. Backed by an Amazon warehouse located near the stadium, the partnership grants 49ers’ faithful access to tens of thousands of different items, including select restaurant and alcohol delivery. Customers have a wide range of products that they can order from. If they need a camping chair, or they run out of condiments, or if they run out of snacks or need more beer, we can deliver all of those things. Delivery within two hours is free and under one hour is US$7.99. The delivery of gameday essentials to tailgaters is just one piece of the experiential puzzle. Other Levi’s® Stadium partnerships include Uber and VenueNext, which both effect customers’ pre-game and post-game experiences. If you forget your red solo cups, or you run out of charcoal, you can just order that while you’re in your Uber on your way to your friend’s tailgate spot. And then have the Amazon Prime Now delivery service meet you at that spot at the same time. The 49ers and Levi’s® Stadium provide another example of how various technologies can intertwine to facilitate a singular fan experience outside the venue walls. Unlike traditional tailgating, The Arena Club at Soldier Field merges the amenities of a suite with the smells and sounds of tailgating on gameday. The Arena Club is an elite tailgating experience that extends the hospitality window you would normally have at a venue. We do it in a way that’s authentic but still has the additional amenities that fans expect. Beginning in 2012, a firm called E3 VIP began renting out Soldier Field’s Adler Lot from stadium management partner SMG to hold high-end tailgating events prior to Bears games. 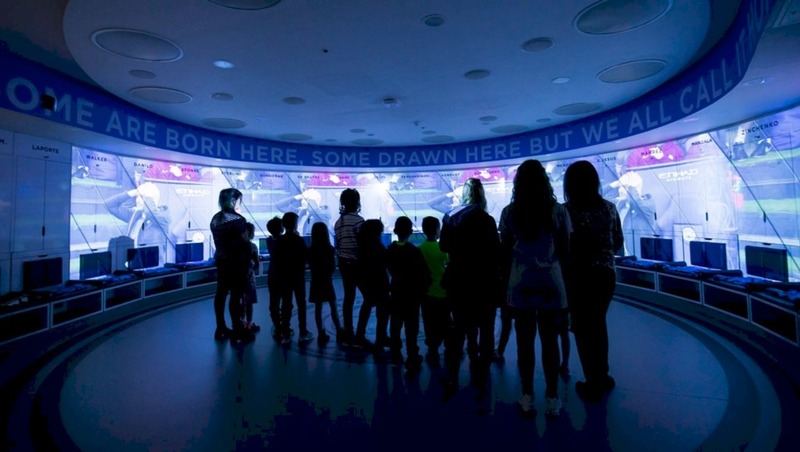 Arena Partners, an experiential agency based in Chicago, acquired E3 VIP prior to this past NFL season and rebranded the experience as The Arena Club. For US$179 per person, The Arena Club offers fans an exclusive, turnkey experience that blends high-end food and drink, live entertainment and a number of additional amenities. Chicago’s market size, paired with Soldier Field’s downtown location, serve to attract corporate entertainment dollars to pre-game experiences like The Arena Club. 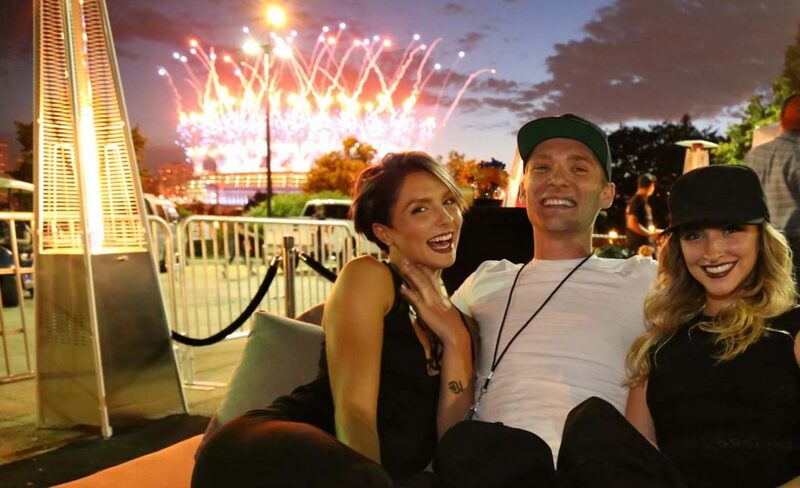 From the perspective of premier tailgating, there’s been a market for it here in Chicago for a number of years or the corporate types or more organized types of groups that want to host large groups of friends or clients or really market tickets. Murray estimates roughly 50% of customers investing in the elite tailgating experience own suites or season tickets with the Bears. We’ve found that season ticket holders and suite holders will pay an additional fee that extends the experience of the investment they’ve already made. The Arena Club experience also provides the venue’s hospitality and sponsorship staff an extra option to provide clients if Bears inventory is limited or sold out. When it comes to scaling a luxury tailgating operation, Block Party Suites and Learfield’s Mustang Sports Properties raised the bar this past college football season with the introduction of the Cox-Lyle Red Zone tailgate village, part of the second year of a three-year contract. Our trademark slogan is ‘Life is better live’. So our whole reason for existing is to facilitate fans of all genres of entertainment in getting out and experiencing live events. By creating enhanced pop-up communities using mobile infrastructure such as shipping containers, Block Party Suites serves a portion of the market that’s interested in a tailgating experience comparable to what they might expect from a stadium suite or their living room at home. 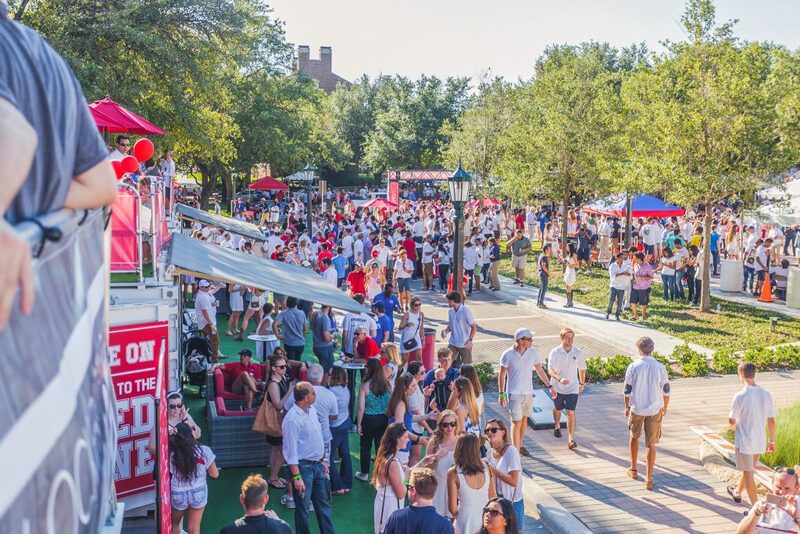 In its second year, the tailgating partnership featured an expanded footprint, accommodating as many as 3,500 fans during the season opener, in addition to a co-branded naming rights partnership between SMU’s Cox School of Business and the Lyle School of Engineering. Open three hours prior to game time, the fenced-in space includes six suite units dedicated to the business and engineering schools. Students, alumni and the faculty of both institutions have access to the area free of charge. Each individual unit comes equipped with TVs, climate-control options, indoor and outdoor furniture, and a rooftop deck. The space also includes catered food and beverage areas, provided by Aramark. During major events, Block Party Suites can add additional suites for corporate partners looking to host an event. The partnership at SMU is unique in that Mustang Sports Properties leases the units from Block Party Suites and sells them to buyers at a rate of about US$5,000 per game. 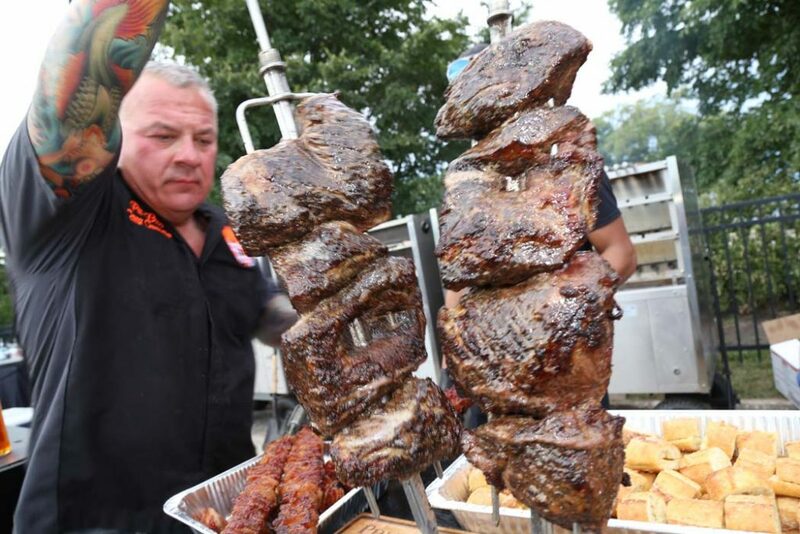 Packages includes 50 tickets to the area, alcoholic and non-alcoholic beverages, and one plated meal. In 2017, Block Party Suites plans to launch additional partnerships with universities with a new model based on revenue-sharing. Moving forward with a lot of the university partnerships that we’re negotiating now, we’ll come in free of charge to the university. We’ll make all the investment in the capital infrastructure in exchange for a revenue split with that property. Some properties are even entertaining rights purchases, so we’re looking at that as well. 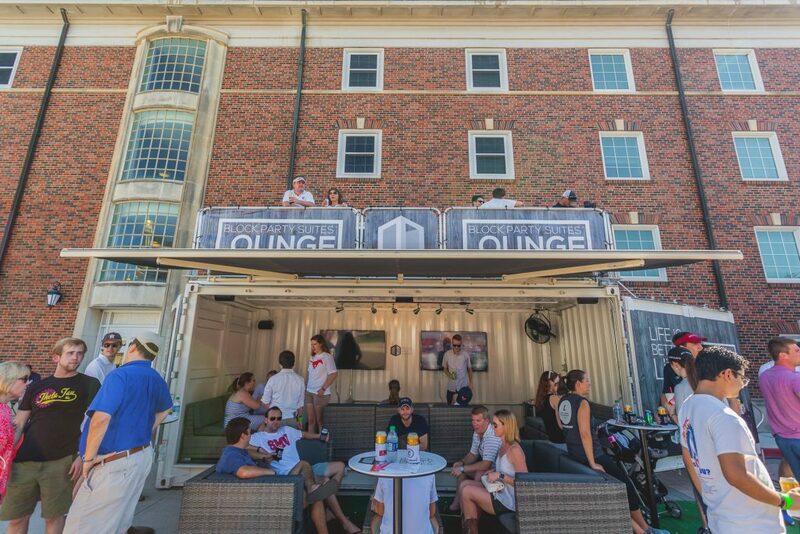 Block Party Suites has also created pop-up experiences for brands such as Captain Morgan, Tito’s Vodka, ESPN, and others. The monetisation of tailgating is a relatively new concept for most teams, but early test runs are validating investment. 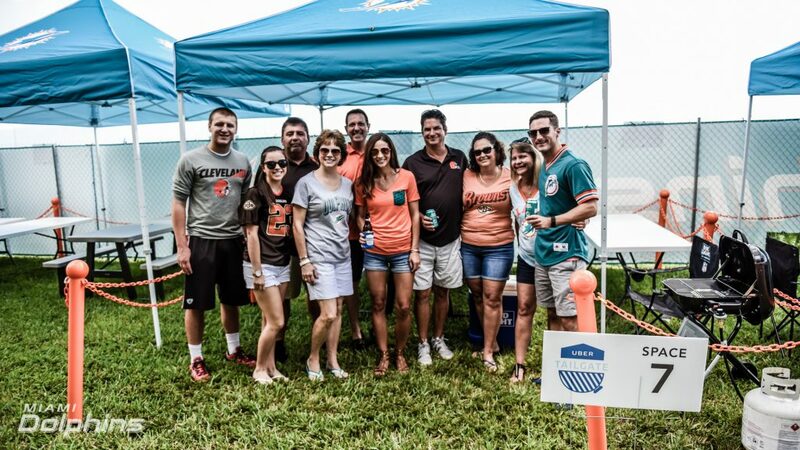 The Dolphins are expanding UberTAILGATE. The 49ers are continuing PrimeNow. And third-party tailgating providers like Arena Partners and Block Party Suites are working on new partnerships. Fans will only pay so much for a parking space. But when you’re able to gather a bunch of bodies around those spaces and entertain them, now that revenue per square foot goes up significantly. The numbers don’t lie, and neither do the fans. It appears outside the venue walls is increasingly the place to be. Explore the ‘Outside the Venue Walls’ theme in more detail and visit Hard Rock Stadium, home of the Miami Dolphins, at the 27th Annual ALSD Conference and Tradeshow. Sports Venue Business is proud to be an Official Media Partner for the ALSD and its members.